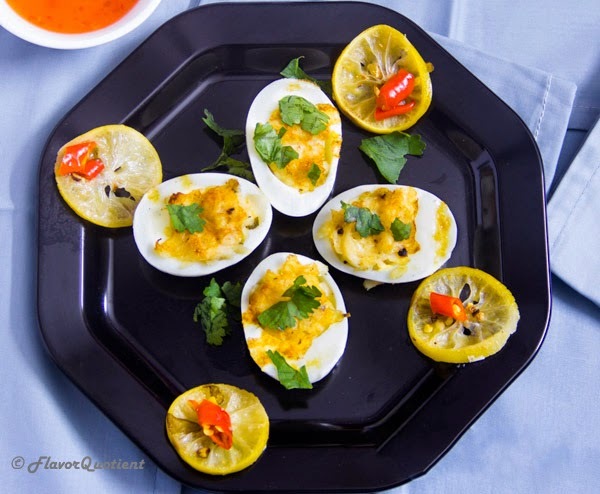 A twist on the classic deviled eggs, these smoked basa deviled eggs filled with smoky chunks of fish had turned out a stunner and will definitely be a crowd pleaser! If you are planning to host a party recently, then this deviled eggs recipe with a twist is just the right thing for you. These are not the classic deviled eggs but it surely will delight your guests specially those who love fish and seafood. My deviled eggs are filled with succulent pieces of basa steamed with lemon and chillies which add immense flavors to the fish cubes and take the deviled eggs to next level of deliciousness. The steamed basa fish is super tasty in itself and being a seafood lover, I would have eaten the smoky fish on its own by myself and these deviled eggs wouldn’t ever have materialized! But fortunately, it did, all thanks to by husband! This recipe of smoked basa delived eggs was my better half’s idea and being both an egg lover and seafood lover, his continued insistence finally made me do it. It’s not very often that my hub suggests any recipe and that too an innovative one; so, I had to give in to the demands and follow through his instructions. The deviled eggs recipe is not even a recipe in the true sense of the term; he could have done it on his own, only the steamed fish part was the one he needed help with, but there is nothing complicated about it. You just need to arrange the fish fillets in the steamer basket and top them with lemon slices, chopped chilies and ginger, that’s it! What can be easier that this? My husband is way too fond of eggs which used to awe me quite a lot during the early phase of our relationship. I can be considered a moderate fan of eggs and I generally do not get too excited seeing any new egg recipe. But that’s definitely not the case with my better half. Since the time we have started our blog and keep on exploring recipes, he always gets hooked to egg recipes, the deviled eggs being one of his fascinations. I agree that deviled eggs look great as a party appetizer and does not take a lot of effort to churn this out; that’s the very reason I agreed to his recipe and made these twisted deviled eggs. Our deviled eggs are not filled with whipped up egg yolks like the traditional ones. We took a step extra and prepared some succulent steamed fish beautifully flavored with lemon, chili and ginger. Once the fish fillets are fully cooked, we lightly mashed it with a spoon but do not go overboard with the mashing thing. You just need to flake them up so that you can use the fish chunks to fill up the egg white cavities. That’s all there is to it. I wanted to add little more depth of flavor into my fish fillets, which is why I added a dash of Hoisin sauce with a kick of rice vinegar; you can add any sauce of your choice. 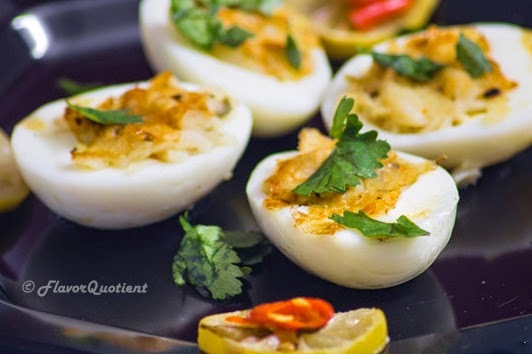 Deviled eggs are single-bite food, so when you eat it, you experience the amazing burst of flavors from the smoky chunk of fish as well as the chewy yet smooth texture of egg whites all at a single bite. Feels just amazing! Take a steamer basket and put a baking parchment paper in it. The paper should be a little smaller than the basket so that it doesn’t come out of it. Take one basa fillet at a time and put it in the basket on top of the parchment paper. Season with salt and top it with half of the lemon slices, 1 chilli and half of the grated ginger. If you have a double basket steamer, put another fillet in the same way on the top basket and then close both of them tightly. Now sit the basket over a pan of boiling water. Steam for 8-10 minutes until the fish is opaque and cooked. Heat the vinegar and hoisin sauce in a small pan. Pour into a small bowl and set aside. Once the fish is thoroughly cooked, take them out on a plate and discard the lemon sliced, chillies and ginger. Now scramble the soft fish lightly with fingers and pour the hoisin sauce mixture spoon by spoon. The fish must not be mashed entirely; you should have a sticky mix with still a bite in it. This would be the filling. Peel the boiled eggs and slice them lengthwise through the middle. Take out the yolk carefully and keep aside. Now take a spoonful of the fish filling and put it inside the cavity of the egg white. The cavity must be tightly filled. Heat a non-stick frying pan and add 2 teaspoons of oil; smear the oil all over the pan. When the oil is smoking hot, add the filled egg whites, cut side down and shallow fry for a minute. We did it on our table grill but you can do it in the frying pan as mentioned here. Take out the deviled eggs once the cut side is lightly charred. Serve the deviled eggs warm with sweet chili sauce. Enjoy!